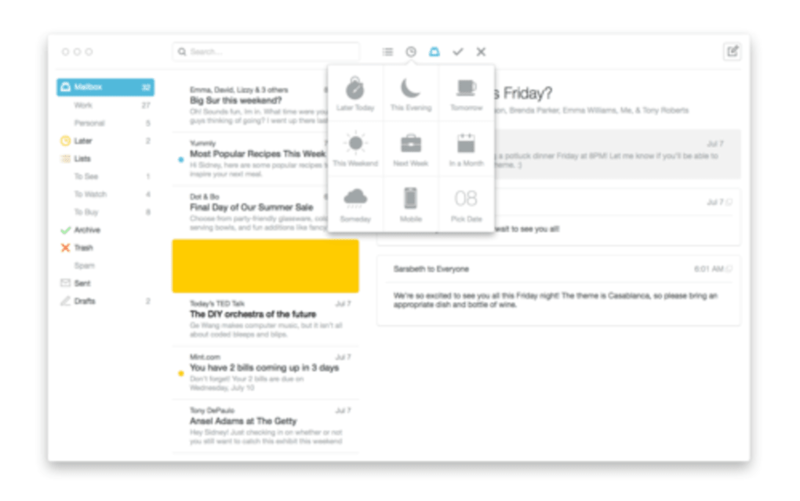 Mailbox for Mac is a Gmail and iCloud mail client that changes the way you manage your emails by keeping your inbox in order. 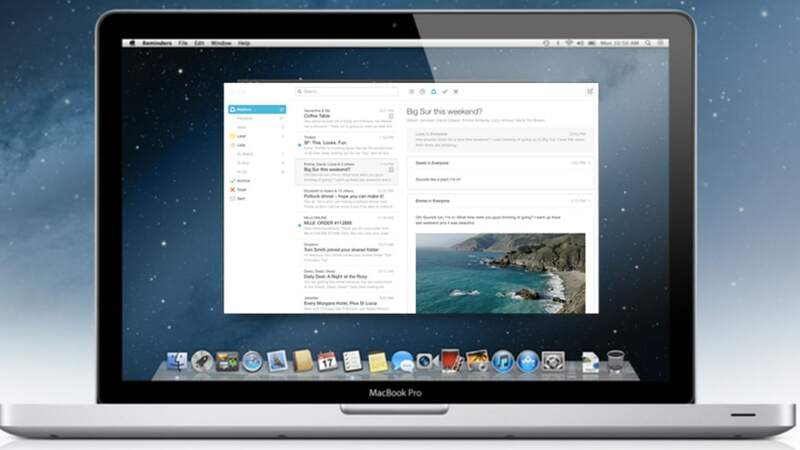 Mailbox for Mac is an email client with a philosophy similar to that of a task manager. 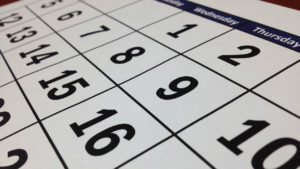 Each email you receive is an outstanding task that requires an action. You can read the message, archive it, or save it for later. After signing in with Dropbox, Mailbox starts by automatically creating folders - such as "to reply" and "to buy" - in your inbox. This sets the tone for things to come. By prompting you to better archive your mail, you are forced to think about the action each requires. Once you are familiar with the system, you can add more categories to further divide and organize your mail in line with your own behavior. The downside to this is that, currently, before really starting to use Mailbox for Mac you have to file away your entire inbox. In my case this was a rather daunting 6000 mails, still it did make for good practice of the system. Plus, even if you get a little lackadaisical about your filling, you will never actually lose any of your mails. But, bar a little encouragement to better file you communications, what does Mailbox for Mac add to your mail management? Well, if you are using it on a laptop, or using a touchpad, then you can make use of its swipe controls. 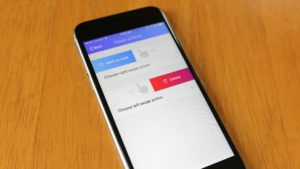 Utilizing left and right swipes you can send your mail to the desired folder. For example, a short swipe to the right on the touchpad sends you mail from your inbox to the archive, while a longer swipe throws it straight into the trash. Simple color coding and icons prove surprisingly effective with this system. As you drag your figures over the pad, the change of a mail from orange to red quickly lets you know if you have accidentally trashed something destined for the archive - prompting you correct accordingly. 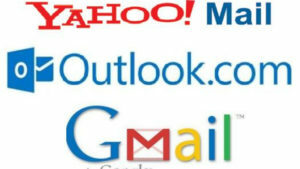 It does take some getting used to, but once you have it set in your mind, it greatly speeds up your mail interactions. 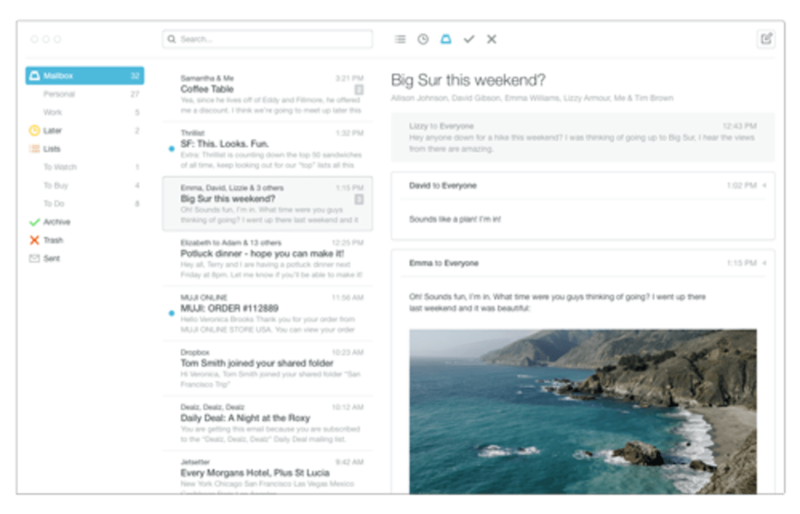 Mailbox for Mac is much more than an email client - it's a different way of interacting with your emails. It forces you to adapt to a new way of looking at things, with the hope of making your life easier. But, for some, the work you have to put in to begin using it effectively may prove too big a barrier to entry. 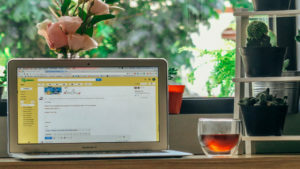 Although some decisions are questionable, such as the waiting lists or its incompatibility with traditional labels, it's undeniable that Mailbox for Mac is fun to use and really does help you get organized.